Just a few days ago, we caught wind of an unannounced Samsung SM-N910 that’s supposed to be headed to AT&T. Since the Galaxy Note 3 (released in September 2013) has the model number SM-N900, this mysterious SM-N910 might be Samsung’s upcoming Galaxy Note 4. According to @evleaks, the SM-N910 won’t be available just via AT&T, but also at Sprint and U.S. Cellular, coming with 32GB of storage space. He’s also saying that this device could indeed be a Galaxy Note 4 variant. Although Verizon and T-Mobile aren’t in the equation yet, we’re expecting them to carry the new Note as well. 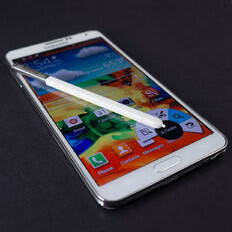 Of course, for now Samsung isn’t confirming anything regarding the next generation Galaxy Note. But rumors have it that the handset will be dust- and water-resistant, just like the company’s Galaxy S5. We don’t know if the Note 4 will be larger than the Note 3 (pictured above), but it’s said that its screen should have a Quad HD (1,440 x 2,560) pixel resolution. This screen may be a three-sided, curved one - although, again, these are just rumors. The Galaxy Note 3 is widely regarded as one of the best mobile devices of last year, so everyone's expecting great things from its successor - which will likely not be announced before September. The line between phablets and phones is blurred beyond recognition now. LG G3 will give a large screen in a smaller body. So yes G3 for me as well. Looking forward to the Note 4 as long as the screen stays under 6in. Would like the water/dust resistance, not to mention the heart rate & finger print sensor. Maybe it's just a new shade of pink. Is this coming soon? Because I thought Samsung had said their next Note won't be out until the second half of the year, though technically June is the halfway point I guess. Note 3 is an amazing device. Gave up my Nexus 5 for it. No doubt a Note 4 will be amazing as well. wow..monster is coming in September,eagerly waiting to play with it. .
Is it possible, that NOTE 4 will be capable of shooting 4k at 60fps FHD at 120fps and 720P at 240fps ??? ?